Decreasing Washington’s competitive advantage among west-coast markets such as Los Angeles, the Bay Area, Portland, Denver and Salt Lake City. Shifting burden onto renters: Increased fees will disproportionately impact multifamily, commercial and industrial properties, where costs will be passed along to tenants. Disproportionate tax burden on Pierce, Snohomish and King Counties. NAIOPWA has formed the Coalition for a More Affordable Washington to ensure lawmakers hear the input of the commercial real estate industry. We can support the state’s economy and affordability by providing our expertise and advice, avoiding unanticipated consequences of proposed changes. The coalition’s efforts support NAIOPWA’s effective, on-the-ground lobbying efforts with the added heft of industry allies to broaden and strengthen the voice of opposition. This grassroots coalition is intended to engage NAIOPWA and industry peers from across the state and across development types to ensure a fair result for our state and our industry. In 2018, the Puget Sound region saw $16 billion in investment sales, including office, retail, apartments and industrial properties. New and increased taxes, fees and regulations threaten to curtail growth. With Washington’s legislative session half over, we urgently need your support. The hotline is open from 8 am to 7 pm weekdays. Be prepared to give your name and street address to help staff direct your message to the appropriate legislators. Please note: The situation is changing rapidly. While we strive to provide the most useful information here, if you have questions, please contact [email protected]. Thank you. Earlier this year, NAIOPWA asked ECONorthwest, an economic consulting firm advising governments, business, and foundations, to provide perspective and commentary on the community and economic development impacts of land excise taxes related to proposals to expand these taxes in Washington. REET and other land transfer taxes are fairly inefficient forms of taxation and raise significant questions about the suitability of a property transaction tax as a robust policy instrument. Real estate excise and transfer taxes are used by states and local government. However, little research has been done to catalog or assess the impacts of these taxes. The Lincoln Land Institute has an active research program to survey these fees and taxes by state and local government. These data are summarized in the map below as of 2017. The Lincoln Land Institute of Land Policy is a nonprofit foundation that seeks to improve quality of life through the effective use, taxation, and stewardship of land as a solution to economic, social, and environmental challenges. 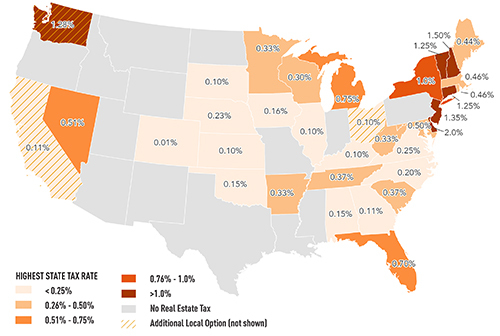 There are 14 states that do not charge real estate excise or transfer taxes. Washington already has one of the highest state excise tax rates in the country. There are only four states with higher rates. Washington is one of three state with additional local option real estate excise or transfer taxes. Undeveloped land, timberland, agricultural land or mineral rights are not included in the new provisions and maintain the current 1.28% state rate. Revenue estimate: an additional $130.3 million in FY 19-21 and $190.6 million in FY 21-23. Additionally, the House proposes a surcharge for certain service businesses and a capital gains tax. Undeveloped land, timberland, agricultural land or mineral rights are subject to the new REET levels in the Senate bill. Revenue estimate: an additional $421.1 million in 2019-21 and $457.3 million in 2021-23. The Senate proposal also includes the elimination of selected tax preferences and a capital gains tax; the capital gains tax is not part of their budget proposal. If the capital gains tax were to pass, it would fund several additional programs in addition to the base budget. *The current state REET is 1.28%, to which local REET options are added.